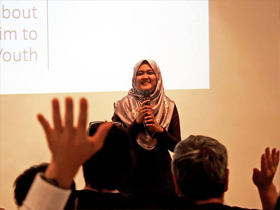 Ms Faizah bte Mohd Salihin sharing her experience visiting Japan under the TAMU programme. 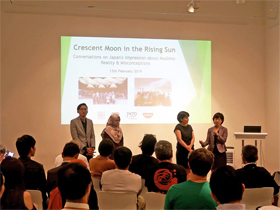 A sharing session by Talk on Muslims series (TAMU) 2018 Singaporean participants entitled ‘Crescent Moon in the Rising Sun – Conversations on Japan's impression about Muslims: Reality & Misconceptions’ was held yesterday on Wednesday, 13 February at JCC (Japan Creative Centre), in conjunction with The Japan Foundation Asia Center, Japan National Tourism Organization (JNTO) and Nissin Foods. Ms Saina Nemoto, Second Secretary of Embassy of Japan who is from The Japan Foundation, started by sharing the background and purpose of the TAMU programme that aims to develop a better understanding of Islam in Japan by bringing together Muslims intellectuals from Southeast Asia. 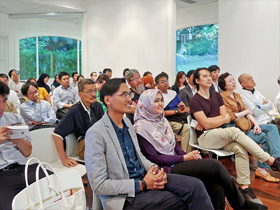 Following which, two TAMU 2018 Singaporean participants – Ms Faizah bte Mohd Salihin and Mr Mohamad Saiful bin Md Anuar, shared about their experience visiting Japan. 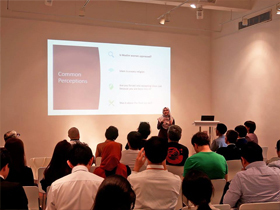 Ms Faizah mainly spoke about the situation of Islam in Japan, common perceptions about Islam she received in Japan, and her hopes towards Japan on Islam. 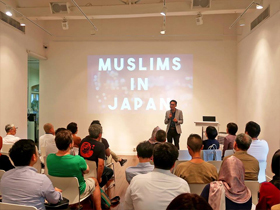 On the other hand, Mr Mohamad Saifu touched primarily on Muslims he encountered in Japan – their stories, experiences and challenges as a Muslim living in Japan. 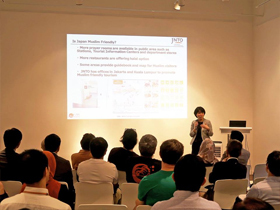 Ms Tomomi Shigematsu, Director of JNTO Singapore Office, came up next to share information on travelling around Japan for Muslim visitors. 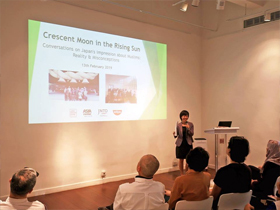 She answered some of the key questions, such as the availability of mosques, prayer rooms, Halal restaurants and Muslim-friendly hotels in Japan which can be found online via JNTO’s Welcome Guide for Muslim Visitors. Mr Mohamad Saiful bin Md Anuar sharing his experience visiting Japan under the TAMU programme. Gifts inside goodie bag for guests to take home. 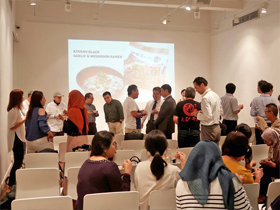 After which, videos about Nissin Foods and their various Halal ramen products were featured at the event, and guests had the opportunity to taste and bring some of them home. 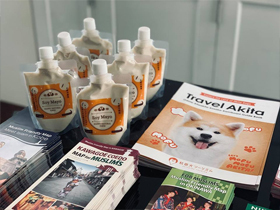 More information on JR-West and Muslims travelling in Japan from Halal Media Japan were further introduced and available in brochures. Guests who answered correctly at our short quiz were also given a small gift from Mr Hitoshi Tahara, Director of JR-West Singapore Office. Ms Saina Nemoto from Embassy of Japan sharing the background and purpose of the TAMU programme by The Japan Foundation. Ms Faizah bte Mohd Salihin sharing her experience visiting Japan under the TAMU programme. Ms Tomomi Shigematsu from JNTO sharing information on travelling around Japan for Muslim visitors. 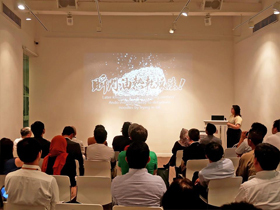 Guests watching a video featuring the history and origin of Nissin Foods Singapore and their noodles. 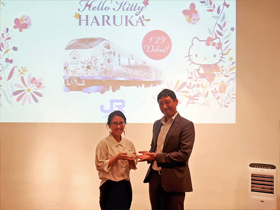 Mr Hitoshi Tahara from JR West presenting a small gift to one of our guests who answered correctly at our short quiz. 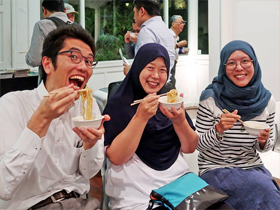 Guests tasting Nissin Foods Singapore’s Halal ramen. Guests looking through the various brochures available at the event. 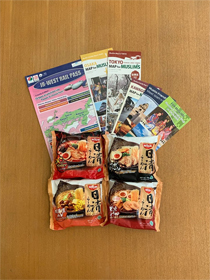 Various brochures including HALAL MEDIA JAPAN, JR-West and The Japan Foundation, as well as information and Vegan Soy Mayo from Akita Prefecture available at the event.